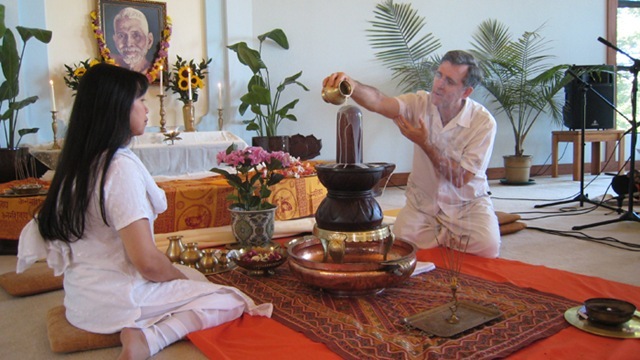 D.: It is said that the Guru can make his disciple realize the Self by transmitting some of his own power to him. Is it true? M.: Yes. The Guru does not bring about Self-Realization. He simply removes the obstacles to it. The Self is always realized. 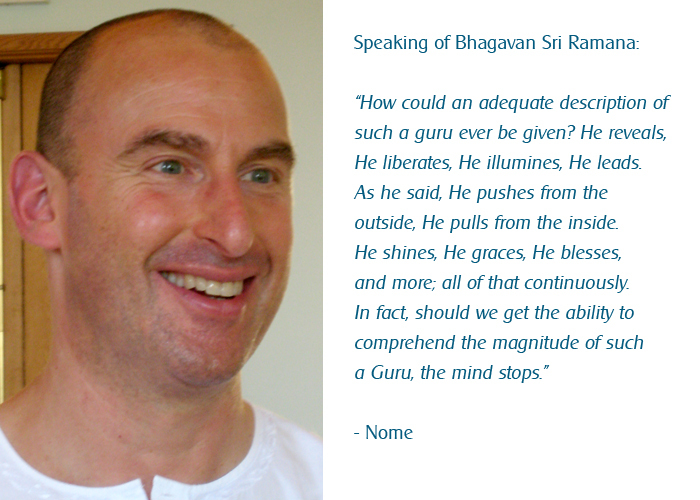 D.: Is there absolute necessity of a Guru for Self-Realization? 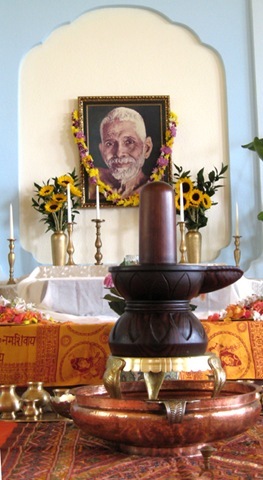 M.: So long as you seek Self-Realization the Guru is necessary. Guru is the Self. Take Guru to be the Real Self and your self as the individual self. The disappearance of this sense of duality is removal of ignorance. So long as duality persists in you the Guru is necessary. Because you identify yourself with the body you think the Guru, too, to be some body. You are not the body, nor is the Guru. You are the Self and so is the Guru. 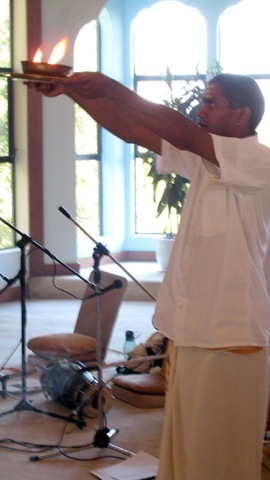 This knowledge is gained by what you call Self-Realization. All disappeared in a moment. But the delusion that arises, disappeared. The following are excerpts from the dialogue. 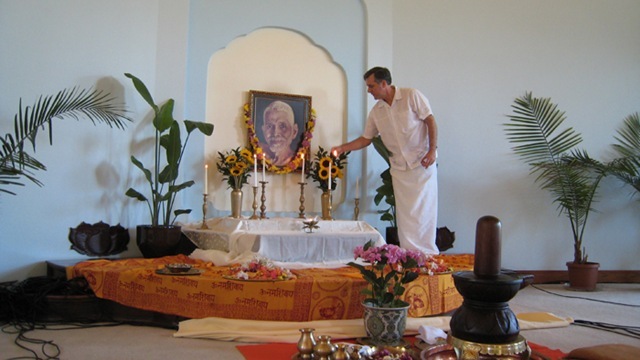 Nome: Sadguru Sri Ramana leads us from the unreal to the real. How does he? He, being the Reality, seems to appear as part of this unreal world…what is unreal has no existence, what is real is the only Existence. He is the Reality. He reveals His own Existence. The Reality awakens the Real to That which is the Reality…you are led to yourself — the light of your own Consciousness. Where are you being led? To the Reality—Knowledge of yourself—which is innately immortal. . . . By the guru’s instruction the nature of the disciple becomes clear; the guru remains and the disciple is no more. There never really is a state of total darkness or ignorance. There is still always one who knows. 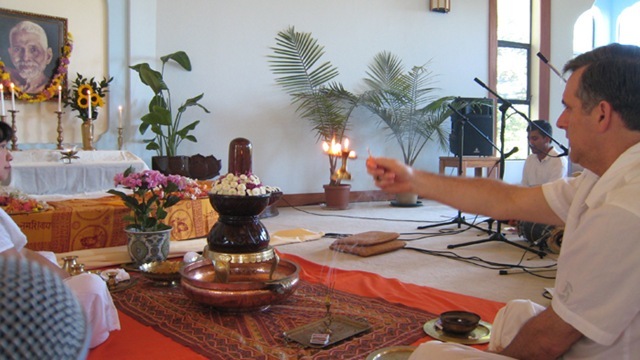 Questioner: The Maharshi has made it clear—doubt the doubter. The only issue is the lack of inquiry about the doubter. Nome: . . . Doubting that which is entirely doubtful is called practice. 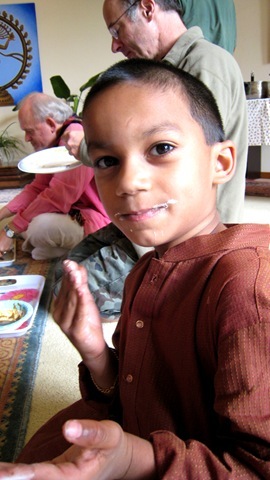 FOLLOWING SATSANG IT IS TIME FOR PRASADAM . 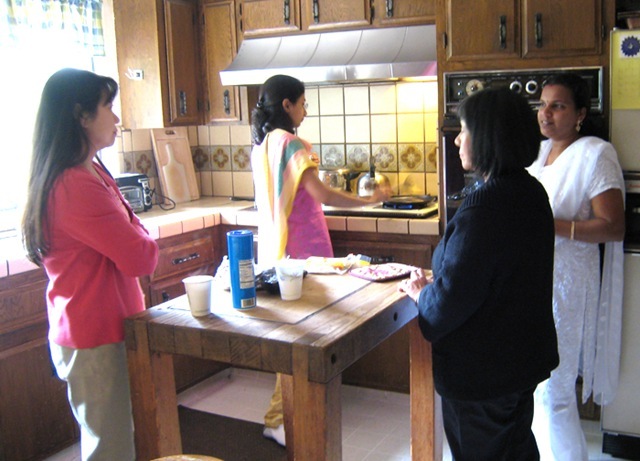 . .
Wimala, Sangeeta, Myra and Dhanya discussing the nature of the universe while Sangeeta is flipping tortillas on the stove. 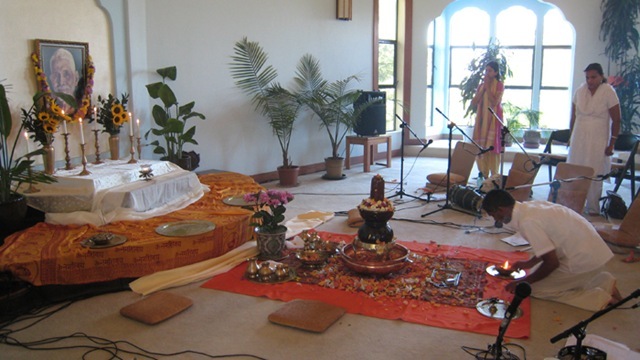 While we wait for prasadam Raman, Nome and Eric setup for puja while Advait supervises. 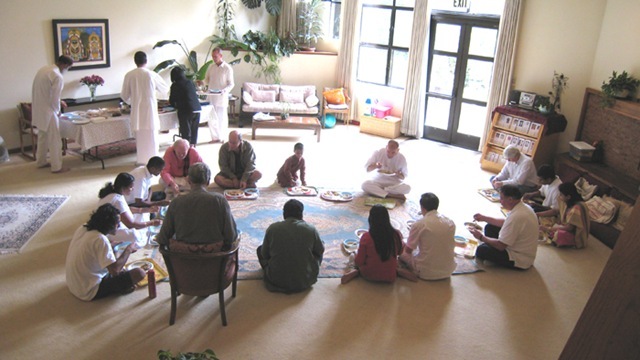 Devotees gather downstairs in the lotus room to share prasadam together. 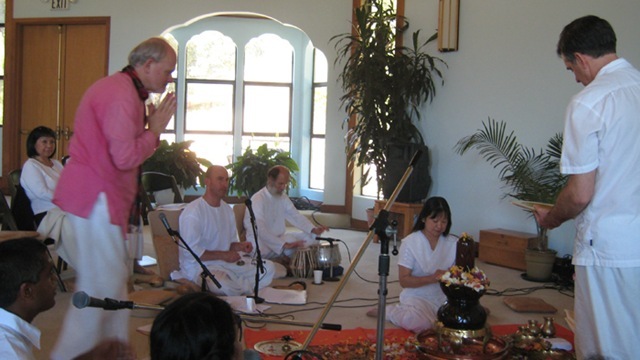 Jay, Eric and Wimala discuss the limitless expanse of pure Consciousness while Ryan is meditating in the background and Ganesh is going for more of that yummy prasadam. 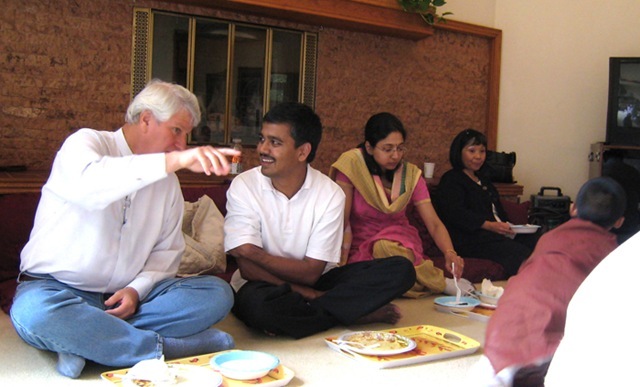 Richard and Raman share their experience of satsang while Sangeeta and Myra enjoy prasad in the background and Advait is sneaking up. Advait is enjoying the Cream of Emancipation in more ways than one while Dan and Raymond enjoy their prasad in the background. Who ever thought washing dishes could be so much fun and downright funny! 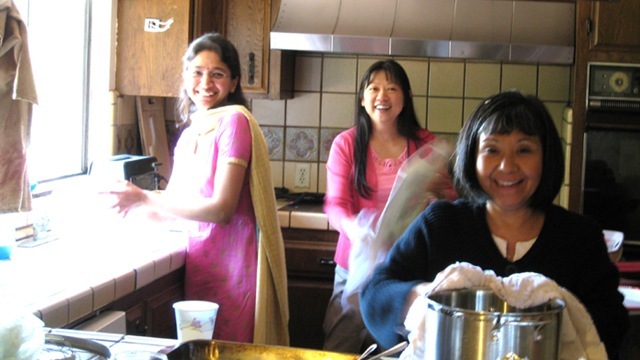 As Ramana devotees everything is fun! 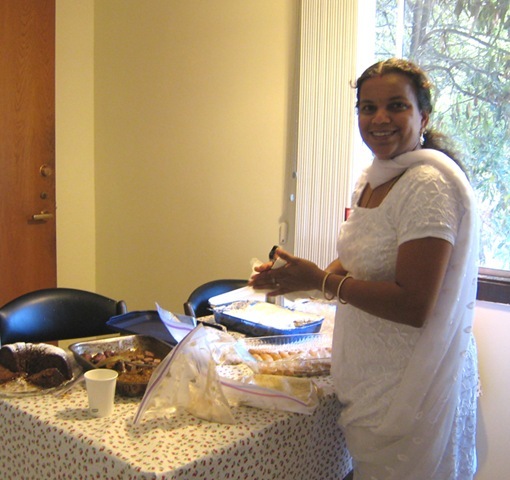 Dhanya divides the leftover prasad for us to take home and enjoy later. . . only the food is divided though . . . never our real nature! 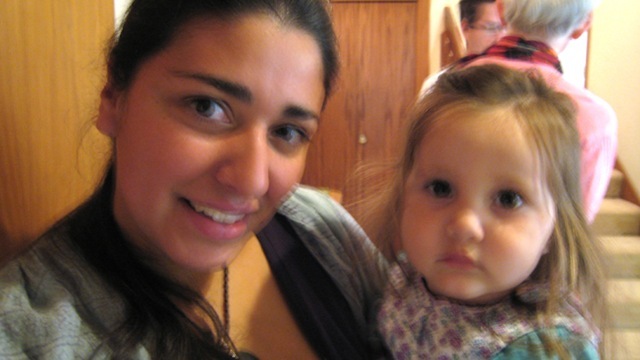 Crystal and her sweet baby girl. This is their first visit to SAT. 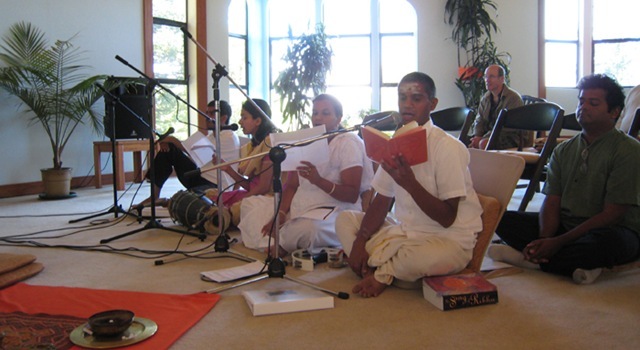 Raman, Sangeeta, Dhanya and Ganesh lead the recitations while Dan and Suresh meditate in the background. 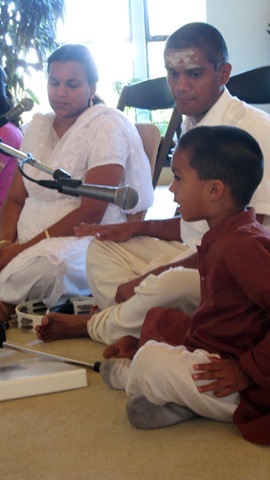 Advait sings a song while his parents Dhanya and Ganesh look on. 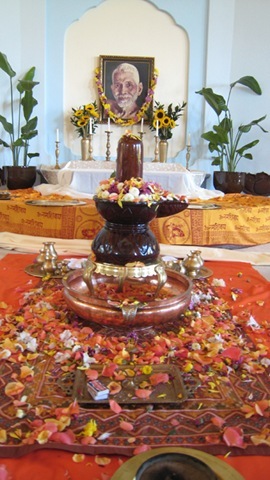 PUJA OFFERINGS BEGIN WITH LIGHTING THE CANDLES AND INCENSE. 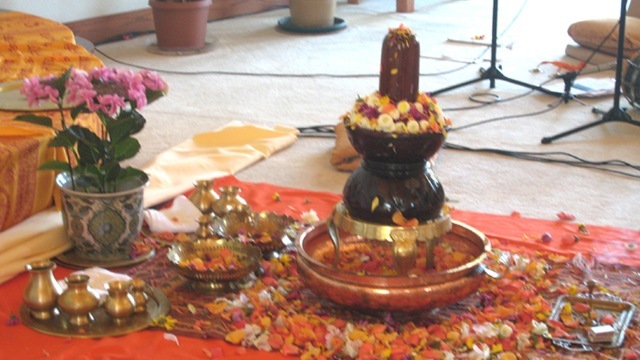 MORE OFFERINGS TO THE SIVA LINGAM WHILE BHAJANS ARE SUNG BY ALL. 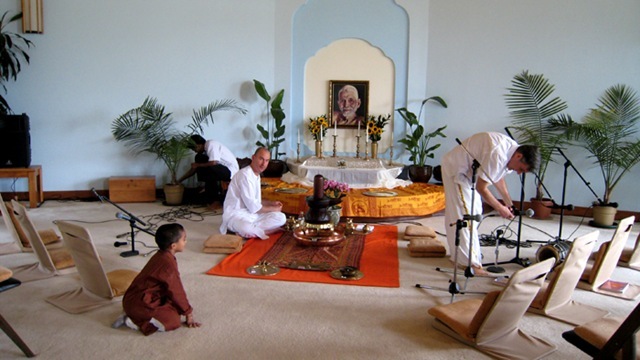 Ryan and Advait goofing off during puja while Jaden is looking on. Uh Oh! Don’t let appa see you! 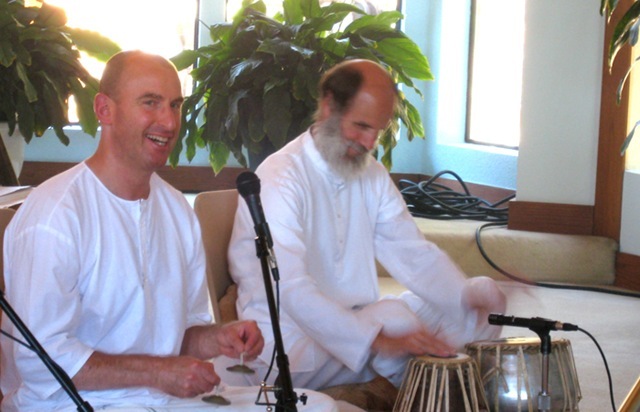 Nome and Bob singing bhagans. 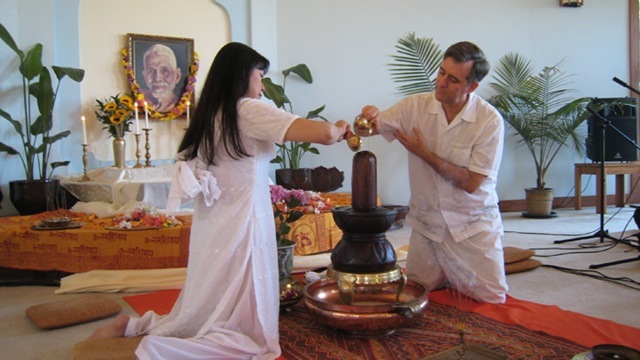 Another wonderful celebration at the SAT Temple! 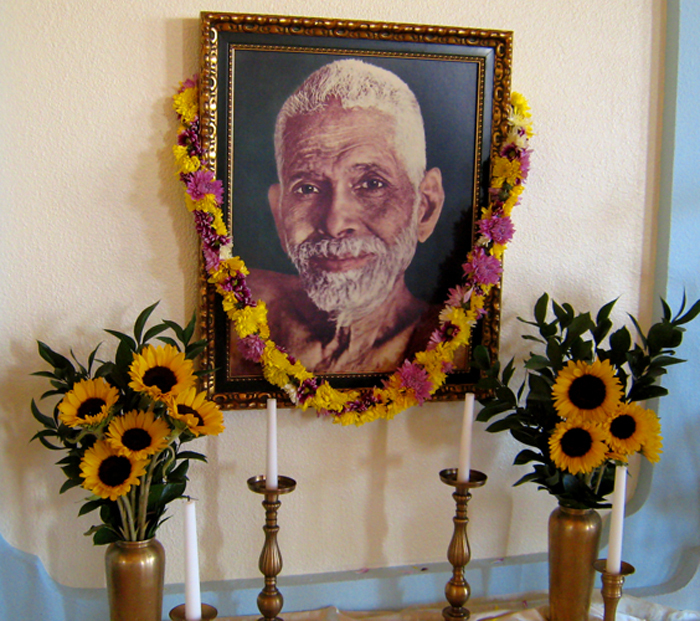 Thank you Bhagavan Sri Ramana for giving us devotion and worship! 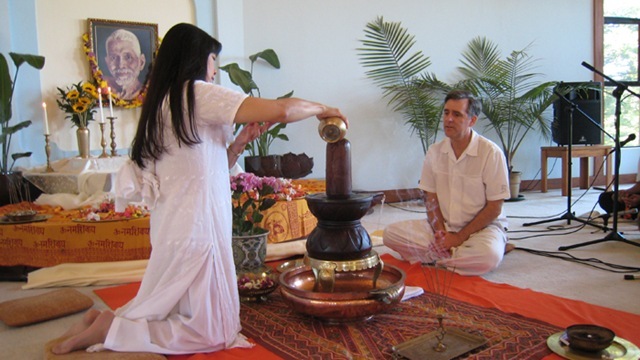 In Sanskrit, purna means full or complete. 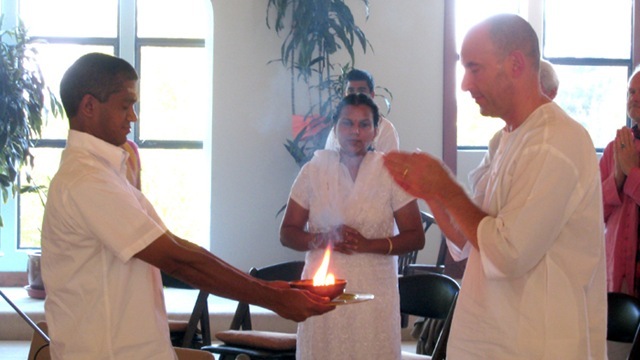 Purnima means night or day of the full moon. The full moon signifies the light of Consciousness shinning in all of its fullness, unobstructed by the shadow or darkness of ignorance. The Guru is the light of Consciousness. He removes the shadow or darkness of ignorance from the disciple. 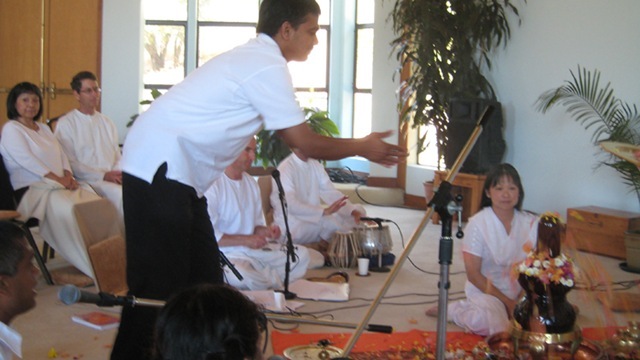 Guru Purnima is an opportunity where devotees can joyously engage in worshiping their guru. Agreed! Much gratitude for perfect blessing from the Temple and a good feature that may grow and shed Grace to more and more of those responding.